Want to fit a lot of sound into any room? Choose the SoundTouch 10 wireless speaker. It's small enough to fit just about anywhere, with full, rich sound that belies its size. With instant, easy access to your music, it's the perfect companion to fit any occasion. And it couldn't be easier to use. To stream a world of music, just install the free SoundTouch app on your device. You can place it just about anywhere to stream millions of songs from music services, Internet radio stations, and your stored music library, all with full, rich sound. You can even play your favorite music instantly, without a phone or tablet. Simply press one of six presets on the speaker or remote, and the music starts. Echo Dot is a hands-free, voice-controlled device with a small built-in speaker it can also connect to your speakers or headphones over Bluetooth or through a 3.5 mm audio cable to deliver stereo sound to the speakers you choose. 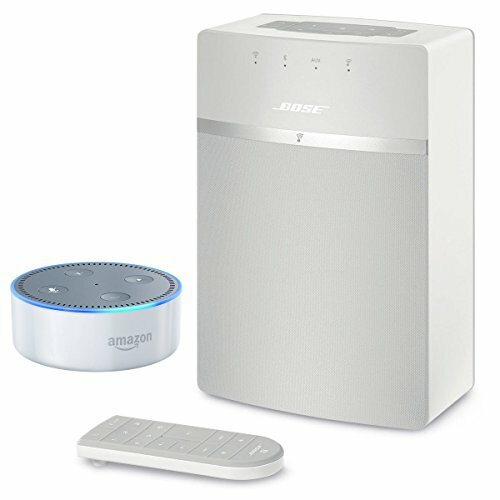 Dot connects to the Alexa Voice Service to play music, provide information, news, sports scores, weather, and more-instantly. Want to fit a lot of sound into any room? Choose the SoundTouch 10 wireless speaker. It's small enough to fit just about anywhere, with full, rich sound that belies its size. Echo Dot is a hands-free, voice-controlled device with a small built-in speaker it can also connect to your speakers or headphones over Bluetooth or through a 3.5 mm audio cable. If you have any questions about this product by Bose-Amazon, contact us by completing and submitting the form below. If you are looking for a specif part number, please include it with your message.